Perhaps you are considering a multiroom audio system. You probably know there are hard-wired and wireless systems and most of them have multi-source capabilities. Perhaps you're even thinking about hiring a professional contractor to install a system for you. Well, think no more – think simple – think Sonos. The Sonos system is an elegant, wireless multiroom music solution with an intuitive user interface that thinks the way you do. You can share your iTunes library stored on a computer or NAS (network attached storage) device, an almost unlimited selection of music, talk and other programs from Internet Radio, Rhapsody, Pandora Radio, Sirius Satellite Radio, last.fm, or any external audio source. The Sonos system can accommodate from 2 to 32 zones or rooms in a home. It uses SonosNet, a wireless mesh network that provides reliable whole-house coverage compared to a central hub network that broadcasts a signal from a single point. With SonosNet, each room acts as a separate wireless hub with wide coverage and, very important, audio synchronization between rooms with no audio delay. 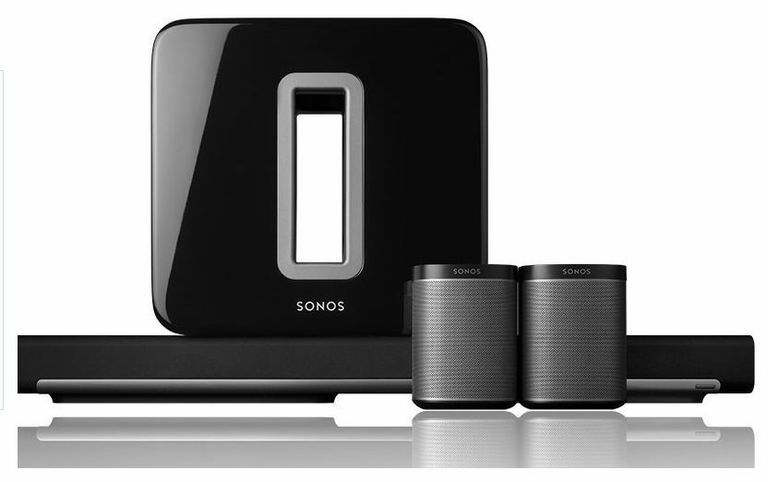 A typical three-room system starts with a Sonos Zone Player for each room. For example, a ZP120 (amplified) Zone Player with a pair of speakers in the living room, a ZP90 Zone Player (un-amplified) connected to a tabletop music system with a pair of speakers in the guest room and the new Sonos S5 Zone Player in the master bedroom. The bookshelf-sized Sonos S5 is a stand-alone component with built-in digital amps and five speakers that fit neatly on a shelf, table, desk or countertop. The S5 has a full sound quality like a pair of good bookshelf speakers with plenty of rich bass and clear midrange and highs. Its hearty sound is ideal for music or talk radio programs and is easy to listen to. The entire system is controlled with the Sonos CR200 Controller, a uniquely simple hand-held remote with a bright, easy-to-read LCD touch display that is one of the coolest parts or the Sonos system. Even better, Apple has a free application that can be downloaded to your iPhone or iPod Touch to control the Sonos system and can be used with or as an alternative to the Sonos CR200 Controller. Each of the components can be purchased individually or in a pre-packaged bundle with zone players and the Sonos CR200 Controller. The Sonos system can be expanded with additional zone players and speakers to add more zones or rooms as needed. Some multiroom audio systems are only slightly less complicated than launching a satellite into orbit. Many require trained specialists to set up and program the system. In contrast, the Sonos system is refreshingly simple to set up and use. The only way to make it easier would be to bribe the 12-year-old tech geek next door to do it for you. Don't bother - you can do it yourself. Place an amplified or un-amplified zone player in each room and connect speakers as necessary. (Note: You may need a BR100 Zone Bridge if your Internet router isn't located in a room where you want music). Install the Sonos Desktop Controller or your Mac or PC from the supplied CD and tell the system where you have zone players. Press two buttons on each zone player to connect them to the system. Tell the system where to find your iTunes music library on your computer, then kick back and enjoy. That's it. There was one glitch in setting up a Mac to stream music from my iTunes library to the Sonos system. A call to Sonos support quickly fixed the problem and gave me a chance to evaluate their support network. The person we spoke with was very competent, solved the problem (a few settings on my Mac) and included a few helpful tips. Note: We did not disclose that we were reviewing the system until the end of the call. The tech also advised that Sonos recommends a wired connection between the computer and the router because of possible signal drop-outs if the computer is performing other tasks, such as checking for new emails, etc. Somewhere at Sonos there is a product designer that did their homework and created a remote control that thinks the way humans do. The Sonos CR200 Controller is intuitive, fun to use, easy to navigate and requires very little time to learn. The controller has three 'hard keys': volume up/down, mute and home key. The Home key takes you back to the top of the menu where connected zones are displayed. Other functions including source selection, favorites, playlists, settings, and others are displayed on the controller's touchscreen. How to use the system: On the controller, select a room, select a source and press Play Now. Each zone can listen to a different source or the same source everywhere, a great party feature. The variety of listening choices leaves nothing to be desired. In addition to the hundreds or thousands of songs in your iTunes library, the Sonos system includes access to the Sirius Satellite Radio network (30-day free trial), Pandora radio for building a music collection in the genre that suits your tastes, Rhapsody radio (30-day trial) and other free Internet music and radio channels. You can compile your favorite music playlists on the system and recall them easily with the controller. You can separately control the program and volume in each zone, and the controller displays iTunes album art and logos (radio stations, etc.) for the source currently playing. Despite the advice given by the Sonos support tech, we did not experience any dropouts while listening to iTunes or other sources, even though we used a wireless router. If you're considering a multiroom system, stop thinking and go online to find out about how to get a Sonos Multiroom Audio System directly from Sonos, your nearest dealer, or compare prices. We reserve five-star ratings for the best of the best, and if any product qualifies it is the Sonos Multiroom Audio System. Dimensions (W x H x D): 7.28" x 3.5" x 8.15"
Dimensions (W x H x D): 5.35" x 2.91" x 5.51"
Dimensions (W x H x D): 14.40" x 8.5" x 4.8"
Compressed MP3, iTunes Plus, WMA, Ogg Vorbis, Audible (format 4), Apple Lossless, FLAC, uncompressed WAV and AIFF files. Native support for 44.1 kHz sample rates and additional support for 48 kHz, 32 kHz, 24 kHz, 22 kHz, 16 kHz, 11 kHz, and 8 kHz sample rates.